Take a trip to a picturesque paradise aboard a private yacht chartered for you and your friends, family or coworkers. 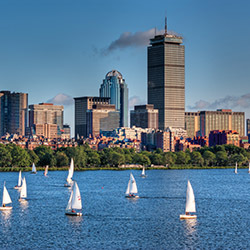 Nicholson Yacht Charters gives you a selection of Boston yacht charters and private yacht rentals to choose from and helps match you with the perfect vessel and crew. Whatever you are looking for in an unforgettable event or a luxurious vacation, Nicholson Yacht Charters will help you find a yacht with the amenities, crew, schedule and destination that you are dreaming of. Celebrate the most important moments in your life with a private, luxury cruise. From the moment you leave the docks at Boston, you embark on a vacation of a lifetime, with your crew, vessel and schedule all planned around your needs. Nicholson Yacht Charters plans private charters for special events including weddings, anniversaries, honeymoons and corporate events as well as tandem charters with large groups, Gulet charters, half board charters, SCUBA charters and more. Whether you are looking for a relaxing excursion on the water, new experiences across the Caribbean and other exotic islands, or a gorgeous setting for a momentous event, Nicholson Yacht Charters will arrange the ideal crew and vessel for you. Take a look at the different private yacht charters available for your vacation or special event. Contact Nicholson Yacht Charters to arrange to charter the perfect yacht and crew for your needs.